Nice cool lager yeast fermenting away. Update 2/20/2014 – Beer placed 3rd as a Vienna Lager in Category 3 European Amber Lagers at the 2014 Homebrew Alley 8 competition. UPDATE 4/5/2014 – Beer placed 1st as a Vienna Lager in Category 3 European Amber Lagers at the 2014 First Round of the National Homebrew Competition (NYC Regional). When it comes to brewing a particular style of beer, I am a serial philander. Rarely do I brew the same beer twice, and when I do it is typically with radical departures to the recipe. Of course, there are exceptions to this rule, and Vienna lager is one of them. I’ve probably brewed four or five Vienna lagers since I began brewing in 2009. While most have been outstanding, and several have won pretty nice awards (Gold in the 2012 NHC first round, and 2nd Best of Show at the 2011 Best of the Bay), I seem to always be making tweaks to the recipe to correct minor details that I believe would lead to a better beer. With this iteration, I’ve gone back to my favorite lager strain, White Labs WLP833 German Bock, which always seems to produce very malt-forward, diacetyl free lagers for me. Additionally, I’ve introduced a single step decoction into the recipe as a replacement for the touch of melanoiden malt that I generally throw into my non-decocted lagers. A small Hallertaurer addition with 10 minutes left in the boil gives the beer an almost imperceptible late hop character. With winter coming, and the ground water cooling, it is the perfect time to brew lagers. My Blichmann Therminator plate chiller struggles with warm summer water, but drops the wort to pitching temperatures with ease during the cooler months. With a little extra time in my fermenation fridge, I am able to chill my wort to 44°F before pitching my yeast. Over the course of the lag phase, I let the temperature free rise to 48°F and then keep it there until the very end of fermentation when I complete a diacetyl rest. This requires a very large starter, but tends to create what I feel is a cleaner lager character. Carbon filtered NYC water with 1g gypsum and 4g calcium chloride added to the mash. 1. Chill to 44°F and keep at 48°F until activity slows (1.5 weeks or so). 2. Raise to 58°F for diacetyl rest 24-48 hours . 3. Cool 2°F / day until down to 34 °F. 4. Rack to corny keg. 5. Lager near freezing 4-6 weeks. This entry was posted in Homebrew Recipes and tagged beer, german beer, homebrew, homebrewing, lager, recipe, vienna by Nick Ladd. Bookmark the permalink. Sorry, forgot to sat Wyeast 2487 not available either. How about WY 2206, 2308, 2633 or 2124 ????? If you can’t get WLP833, WLP830 (Wyeast 2124) is a great yeast as well (I just kegged a version yesterday using this yeast). Thanks Nick for the suggestion.. I do like WLP830 too. Very good results,,, no wonder its the world number 1. Well, i went for WY2308 in the end. I thought id buggered up a double batch… 20l of German pills and 20l of this stuff. 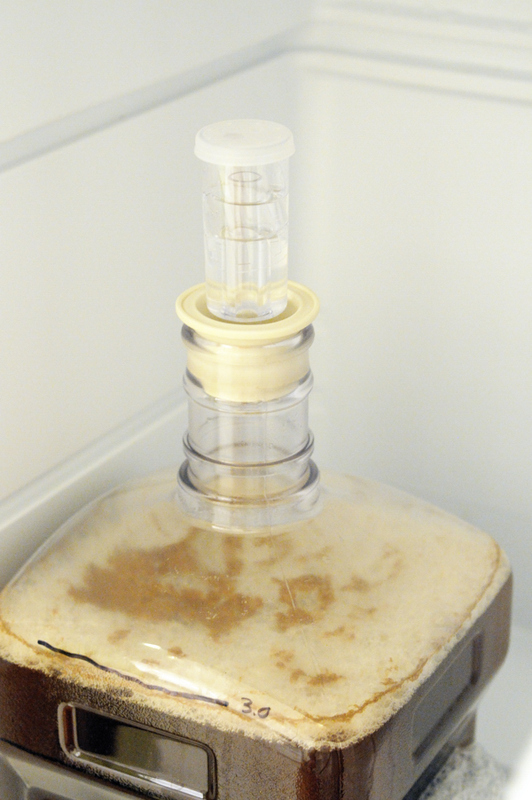 Pitched it high to wait for activity, woke up in the morning… fermentation half way!!! Waited one week… Good old WLP830 ok in the pills. But Vienna… Yuk… I thought it was Estery . Vienna and 2308 … It wasnt Ester… It was Dyactyl. Should have left it longer…. Its ok anyway. Very drinkable. Big flaw for lager though. That’s a bummer on the vienna with diacetyl. How big of a starter did you use, and what temp did you ferment? 3 days of fermentation before d-rest sounds pretty quick; is this correct? In any case, it’s good to know these things so I can avoid diaceyl myself. Thanks for the post! 4L starter, fermented 18 half the way down (whoops! ), then crashed to 11 for the next bit.